Ear candling, also known as Coning, is an alternative medicine method of ridding the ears of earwax, ear aches and improving general health. 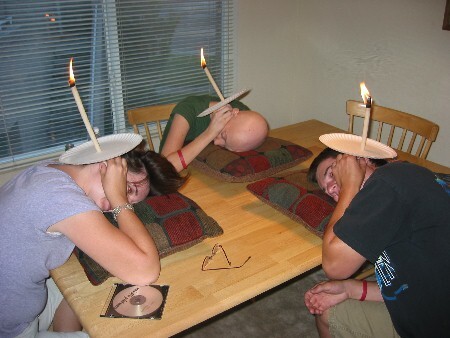 The way this works is that a hollow,conical candle made of either beeswax or paraffin wax is placed in the ear canal and once the candle is lit, earwax and other kinds of impurities from the brain, facial sinuses and inner ear are sucked out of the ear. The lit candle placed in the ear canal acts as a vacuum to remove these unwanted debris. 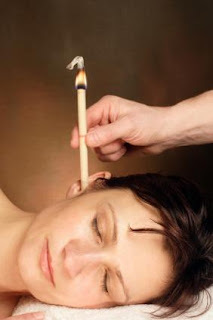 According to earcandling.com, the practice of ear candling dates back "thousands of years and has been found in nearly every culture since the beginning of civilization." However, several accounts claim that Ear candling originates back to Ancient China, Tibet, Egypt, the pre-Columbian Americas, and even Atlantis! Is this method actually effective in accomplishing these benefits? The process of conducting ear candling includes having the person turn on their side in which a "collecting plate" is held above their ear. A collecting plate is a plate that has the candle inserted into a hole and into the ear canal. Light the candle and when the candle is removed, remove the visible earwax/debris and apply ear oil. The debris is supposed to be a dark residue. The wax drips into a bowl of water. However, there are some problems and precautions into take into consideration when performing this task. Some of the dangers of ear candling include burning, infection, perforation of the ear drum and obstruction of the ear canal. Another risk is that that the eardrum might rupture from trying to peel off the sticky wax. One candle manufacturer claimed that their candles are only made of beeswax because paraffin is supposedly carcinogenic. An assumption that can be made about this technique is that it works and that these claims/benefits are correct. Another assumption is that it is therapeutic since it is eliminating impurities and fixing imbalances in the body. This technique gives the assumption that there is a direct connection of the ear to the brain. An implication of ear candling is that it is a method that has been overlooked. It is a secret dating back to ancient times based on medicine used by numerous ancient civilizations and this secret needs to be spread to the people. Personally, I would not want to take the risk of having this procedure done to my ears even though I have problems with my sinuses. The internal ear contains many delicate parts that have long lasting damages if the method is not done properly. I might run the risk of burning my ear canal and other parts. I also would not try this technique because there are still many uncertainties, including the actual origin of this technique as well as the correct tools (wax) to use. Some of the benefits claimed to result from having this done are somewhat vague and have no scientific evidence that proves otherwise. Would you be willing to try ear candling? An ex-boyfriend of mine actually did this. His ear was hurting him (I personally think it was an infection) and he actually was sitting at my table doing this. Of course, if it was an infection this would never help. I think he was just nuts, and it didn't end up helping. I think he ended up getting some sort of ear drops. It was definitely something to see though, some guy sitting at a table with a candle stick hanging out of his ear. When I was younger, I had this terrible ear infection. What happened was some waxy material clumped together into this tiny thing and lodged itself behind my eardrum. My eardrum was not vibrating like it should and I could not hear out of that ear for two weeks until the doctors did an ear washing (not pleasant). After that incident, I had about two more infections within 3 months. So now, I have to be careful with my ears; I can't wear the ear-bud headphones, I chew a lot of gum, and I wear earplugs everyday when I shower. Based on this experience, I do not want to risk anymore damage to my ears by inserting a candle in my canal (regardless of what wax it is made of). After looking at the supposed benefits of this procedure and then reviewing the precautions, I can't imagine why people would risk making their health worse when there are better ways to handle some of the medical issues. Some of the claimed benefits, such as purifing the blood, aren't even linked to the anatomy/physiology of the ear at all. Ack, this is a terrible idea. I know someone who claimed his grandfather's hearing dramatically improved after this procedure, but I am still skeptical. The idea of inserting something large and foreign into the ear that could possibly leave behind residue and burns makes this form of "alternative treatment" seem unappealing. Ear-related health issues should be taken care of by a doctor, in my opinion, not someone with a candle. On a related note, Q-Tips are not good for cleaning the ear, I hear. My sister did this and the stuff that came out of her ear was disgusting but it only worked a little bit. She ended up having to go to the doctors. It's definitely better to go to a doctor then try this. I've heard of old fashioned remedies for ear-aches such as hot garlic and oil (Which does actually work by the way) that actually does help. However, I feel like you inserting anything that large into your ear will only do damage.